Chinese trampolinist extraordinaire, He Wenna looked poised to add another gold medal to her glittery cabinet. And then a slight miscue saw her fall to third, giving Canadian Rosannagh MacLennan top honours. In a given moment, a minor failing can ruin an otherwise solid endeavour. 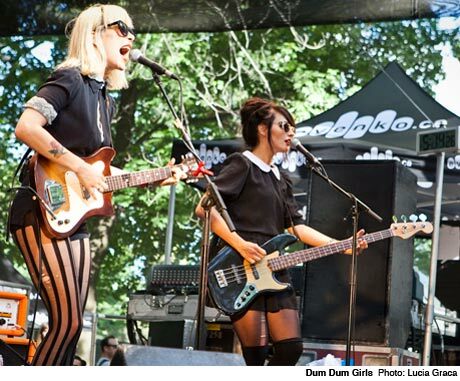 Set up on a sylvan stage in front of an earnest crowd, L.A. guitar pop band and 1960s girl-group fans, Dum Dum Girls had a good chance to deliver a fan-converting set. Then a nagging sound glitch turned up. Wreaking sporadic havoc, it delayed and plagued the proceedings. Still, the unflappable rhythm section -- led by drummer Sandy Vu -- held together cuts like the sway-inducing "Always Looking." Frontwoman and mastermind Dee Dee (aka Kristin Gundred) did her best with an uneven mix, her vocals coming to the fore for highlight "He Gets Me High." See, He Wenna, bronze medals are okay too.